Get Treatment and Relief for Herniated Disc Pain by a Chiropractor In Westminster, MD! Any non-acute (>1 week) low back or neck pain syndrome not related to a disease process, canal stenosis or acute strain/sprain injury is theoretically treatable by decompression. Disc and facet pain can often be relieved by early intervention with decompression. The acute inflammation of injuries however should be reduced by other means, in most cases, prior to beginning Decompression. Contraindications are similar to manipulative therapy, however since mechanical stretch creates no impact, mild to moderate Osteoporosis may not be contraindicated. (This holds true overall for frail and elderly patients who could potentially be injured by manipulative thrusts. Disc fragmentation, calcification, severe arthritis and any surgical spinal appliances are all relative contraindications. 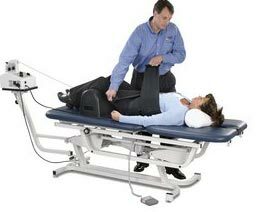 Spinal Disc Decompression, utilizing Decompression-Reduction-Stabilization, is a unique, non-surgical therapy developed for the treatment of chronic lower back pain, herniated discs and degenerative disc diseases. There is some suggestion in the literature that extruded nuclear material may be “drawn in” by the reduction of intradiscal pressures. This concept however is not uniformly accepted since the length of time the material stays ‘drawn in’ has not been established in controlled studies. However, a temporary reduction in intradiscal pressure can still have a profound effect on the healing process via increased contact with the blood supply and fibroblast migration (so called phasic effects). This is in addition to the pain relief created neurologically by stretching soft tissue (e.g. stretch receptors, mechanoreceptors etc.) make decompression therapy a logical and viable addition to a “passive” pain care regiment. Clinically it is important to establish criteria both in the utilization of Decompression therapy and in defining its utility. (As with many therapies, hyperbole and overstatement are common.) Axial Decompression (both lumbar and cervical) is first and foremost a “passive” therapy and as such has definite limitations in “curing” a chronic musculoskeletal condition. Its value is most specific in helping referral pain not solely low back or acute low back pain (symptoms for which manipulation has proven beneficial). Loss of local muscle control, abnormal posture and alterations in spinal curves are the probable underlying source of most spinal ‘compression’ and degeneration. Therefore a “passive” therapy has little effect in truly fixing the underlying problem. However, that being said, Decompression therapy (done safely within established protocols and a clear understanding of it’s limitations) can often effectively enhance the healing process and render quick, effective and often amazing pain relief in a properly selected patient population (many who have previously failed other treatments). Additionally it may also be very useful in determining the overall prognosis of passive care and expediting the phase-in of rehab protocols. If you’ve been asking yourself: “Where can I find the best local chirporactor near me?”, we’d love to schedule a time to help you. We’re in Westminster, MD, close and convenient to Manchester, Hampstead, and Finksburg. So if you’re suffering from lower back pain, neck pain, hip or shoulder pain and want rekiief give us a call and we’ll answer your questions.